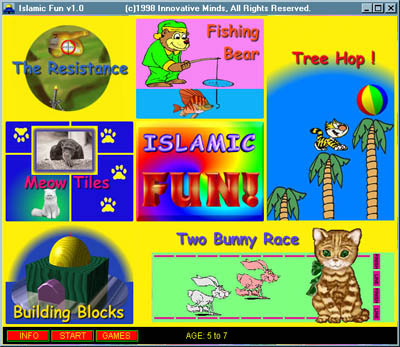 Your child will learn about Islam by playing lots of exciting games, full of colourful animations and cute sounds effects. 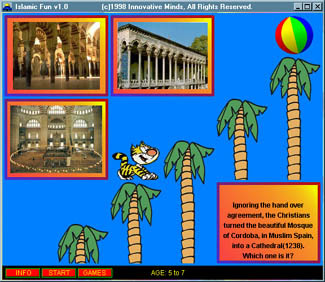 Six different games to choose from, with lots of levels - each time they play its different - lots of fun! 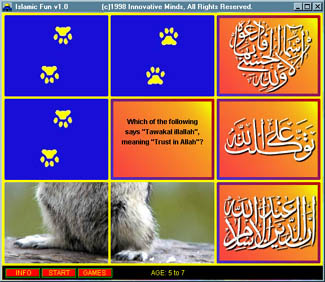 The games revolve around an Islamic database of over 1000 questions - each with audio, and lots of images. Three separate age groups supported : 5-7 years, 8-10 years and 11 and over - each with its own database of questions. Makes a great gift. It will keep the whole family entertained for years to come ! No complicated installation procedures - just insert CD into drive, it autoruns from CD, there is no installation! Min. Requirements: Windows 95, 16Mb RAM, CDROM drive, Sound card. Help the cat retrieve its ball. Two player game - which bunny will cross the finish line first? Help the cat uncover the image - what is this cute creature? five hungry quests to feed! You are a farmer in South Lebanon who has joined the Islamic Resistance to defend your land and family from the invading zionists. (*) Some in the media have kicked up a fuss over this game. It seems that the media is silent when they, the zionists, use their tanks to slaughter our children but when our children play a shoot-em up game where they shoot zionist tanks in return for correct answers we are accused of training terrorists and instilling hatred towards Jews! 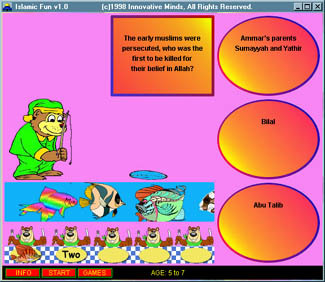 On the contrary the questions in the game educate children not to fall for the zionist lie that zionism, jewishness and Judaism are synonymous but to understand that zionism, a racist ideology, has nothing to do with Judaism - one of the questions in the history/politics section asks "What is the difference between a Jew and a zionist? ".